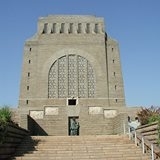 The Voortrekker Monument, designed by Gerard Moerdyk, comprises huge figures of the Great Trek leaders on the four corners. The Monument is surrounded by a laager of life-size ox-wagons. The freeze on the inside of the Voortrekker Monument tells the story of the Voortrekkers. There is also a Voortrekker museum. Fort Schanskop, one of the four fords build after the Jamison Rades in 1896, commissioned by Paul Kruger was completed in 1897. Fords are build to protect Pretoria from their enemies.